RUD distributes recycle bins, office recycling bins and containers to make recycling in offices, schools and public venues simple and easy. 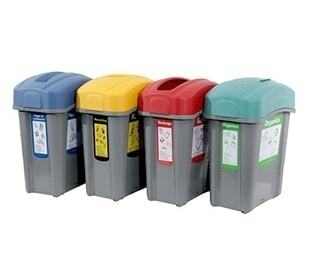 The wide range of recycle bins and containers available from RUD enables stylish and practical recycling solutions. In the interests of sustainability, it is important to provide people with access to recycle bins and containers in public areas and office recycling bins in corporate environments. Whether you require internal or external recycle bins, RUD can provide the solution. Contemporary and stylish internal litter bins are ideal for inside modern offices and businesses, complementing the surroundings. 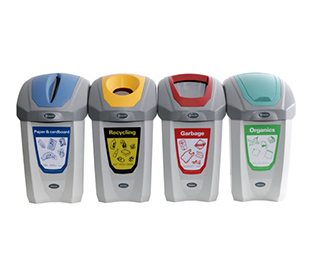 All our external recycling bins are designed to be hard–wearing and long–lasting. Large capacity indoor litter bins, great for schools, busy shopping centres and canteen areas where there is a large volume of people. 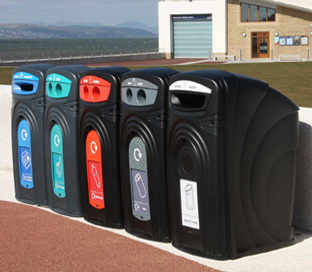 Cost–effective recycling solutions are ideal for on street locations, schools, shopping centres and leisure environments. Highly durable materials to ensure a functional and long service life. Bright graphics ensure the correct usage.